You may not know it, but your crawl space keeps many important parts of your house safe, such as pipes and cables. Unfortunately, these things and more can be at risk if not kept in decent shape. Animals can easily get inside and damage everything from insulation to the vapor barrier that's there to keep out moisture. If the latter happens, or water leaks inside, mold will spread and weaken the whole structure that your house is resting on! Insects may also be drawn in and destroy wood as well. In any case, it's best to make sure all of these troubles are taken care of as soon as possible. What Are Signs It Needs Repairs? Without even needing to look into the crawl space itself, you may be able to tell if something is wrong. If a bad smell is emanating from near the door, or if your allergies seem to be irritated more than usual, mold could be the cause of both problems. If you do take a peek inside and notice moldy or warped wood, standing water, or damaged insulation, these all indicate that it's certainly time to call a professional! Whatever the trouble with your crawl space, our technicians will get it taken care of! When it comes to standing water, we can quickly get it all drained out so that we can tend to any of the structures that have been harmed and ensure that everything is secure and safe. As for a busted vapor barrier, we'll get that replaced right away. Sometimes the vents or door may not be airtight and therefore allow in moisture, but we can install new ones to keep this from happening! Other services include a dehumidifier to protect more thoroughly against moisture, and winterization to make sure your pipes won't freeze and your floors aren't too cold. 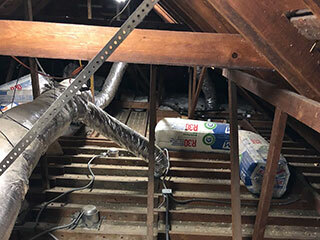 Call Attic Cleaning Simi Valley now and let us take care of all of your crawl space's needs in no time.